Theeyal is a typical Kerala based dish and very popular in South India. The word theeyal means “burnt dish” featuring roasted coconut gravy and is dark brown in color. It gets its colour from roasted coconut paste and tamarind. 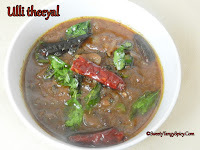 Theeyal can be made with bitter gourd, tomato, yam, prawns etc. 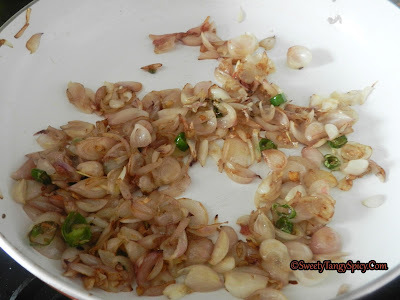 and also with shallot or pearl onion (cheriya ulli in Malayalam) which we are discussing here. 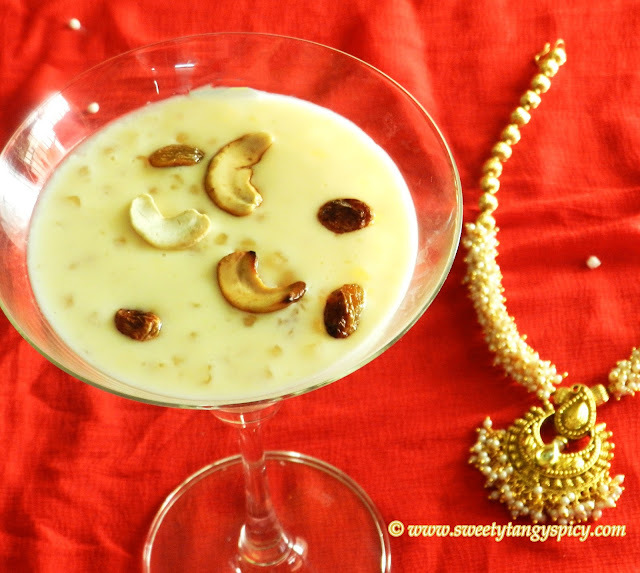 Here, pearl onion is cooked in tamarind and roasted coconut gravy and is usually served in sadya (Kerala's Vegetarian feast) in some areas. 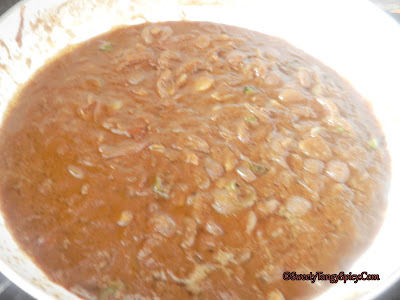 If you are moving from regions to regions in Kerala can see many variations of this dish. But the following is the my way of preparation. 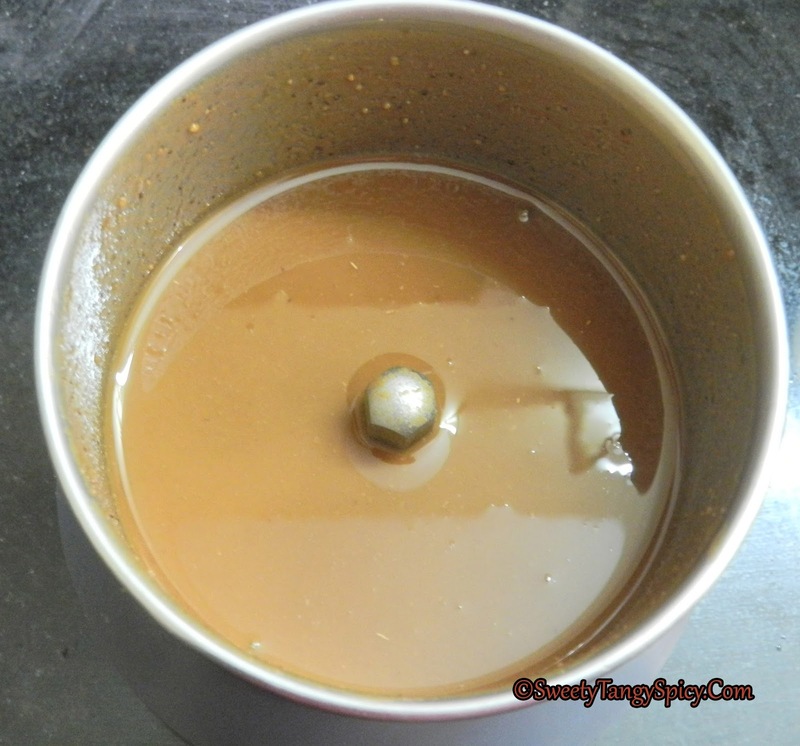 Heat oil in a pan, fry coconut till became dark brown in colour. Stir occasionally. Add red chili powder, turmeric powder and coriander powder, mix well and immediately switch off the stove. Let it cool down. 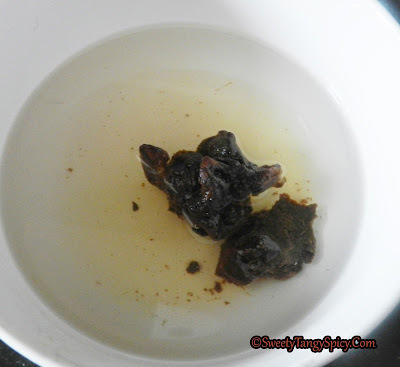 Meanwhile, soak tamarind in ½ cup hot water and take extracts from it. keep aside. Heat oil in another pan, add green chilies and chopped ginger, saute for a minute. Add thinly sliced shallots and saute till they became light brown in colour. 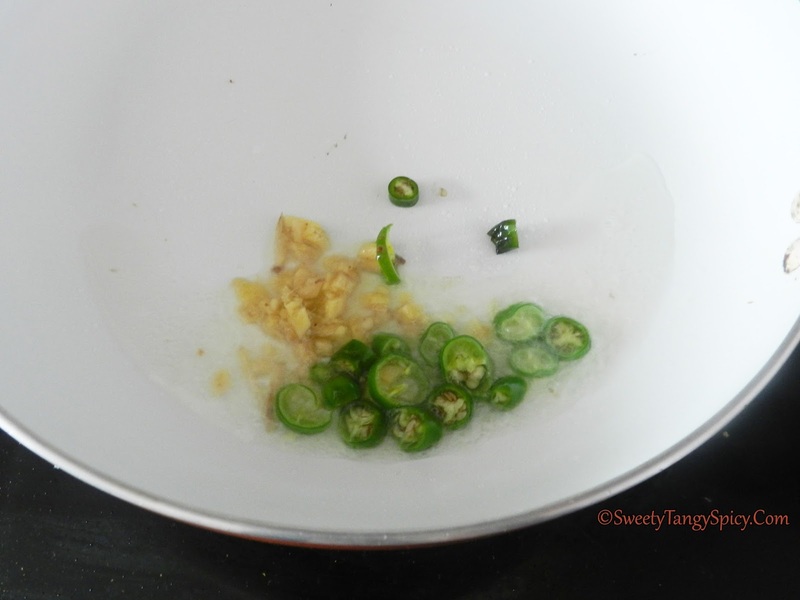 Add the tamarind extract to the shallots. Let the shallots cook in tamarind extract for a few minutes. Then add salt, roasted coconut paste and ½ cup of water. Cook well and mix till the oil separates. To prepare the tempering, heat oil in a small pan, crackle mustard seeds, throw dried red chilies and curry leaves, saute for a minute add this to the theeyal and serve hot with rice. Grind into a fine paste without adding water. (The oil from the coconut will release while grinding). 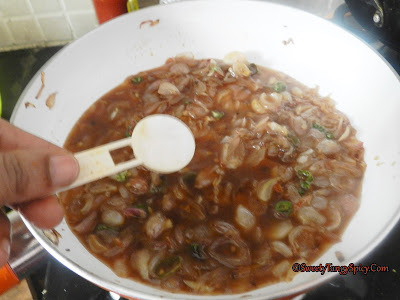 Add the tamarind extract to the shallots. 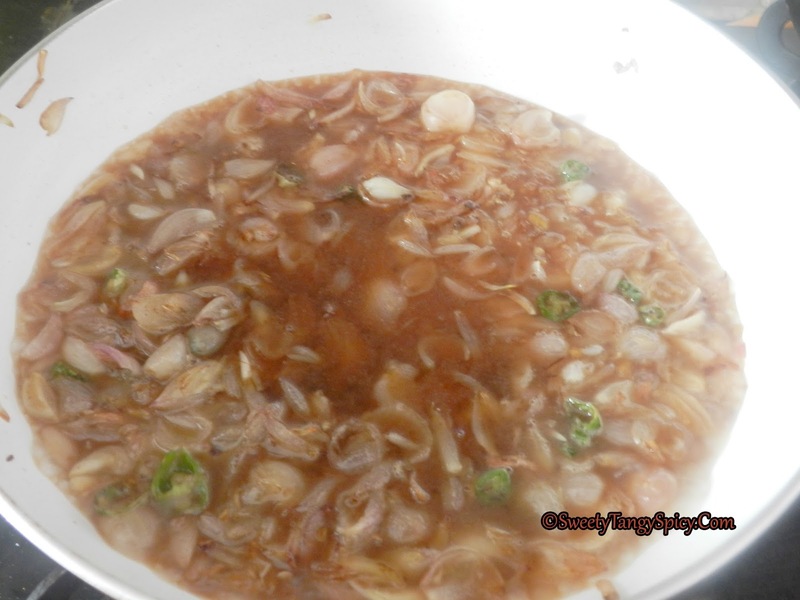 Let the shallots cook in tamarind extract for a few minutes till the water reduces to half. 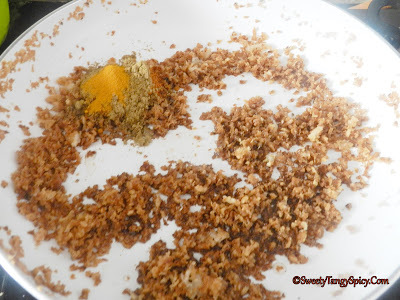 Then add the roasted coconut paste and ½ cup of water. Mix well and cook till the oil separates. 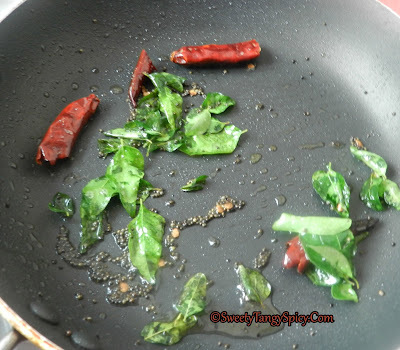 To prepare the tempering, heat oil in a small pan, crackle mustard seeds, throw dried red chilies and curry leaves, saute for a minute add this to the theeyal. Quantity of tamarind varies depending on its strength. Taste the tamarind before use. ALL CONTENT, IMAGES AND TEXT COPYWRITED © 2018 SWEETY TANGY SPICY.COM. Simple theme. Powered by Blogger.